Note: This recipe is an homage to “Bob’s Short Ribs Bourguignon”, by one of my favorite chefs from the Outer Banks. A few years ago, I was privileged to spend some time with a chef during a group cooking class. He cooked in a way that was very similar to my own, using his hands/eyes as a way of measuring ingredients and his intuition as a way of creating a dish that was both delicious and flavorful. Having a trained chef share his take on a traditional, classic recipe was a gift beyond compare and I’ll always be grateful to him for opening my own eyes to cooking this way. This recipe used some basics from Bob’s recipe and added my own twist, allowing me to use my own intuition (The Force) to create a new dish. 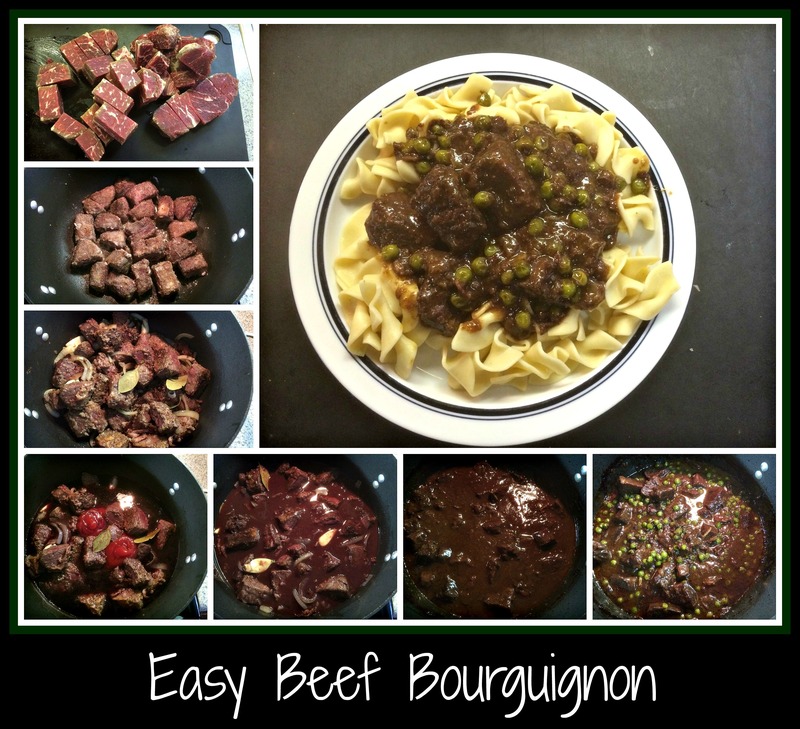 I was at a wine/food festival recently and was asked if I had a Beef Bourguignon recipe on my blog. Since I hadn’t “formally” cooked and blogged about this recipe, I decided to remedy that problem as quickly as possible. I started with a package of beef that I found on sale at my local grocery store. NOTE: I try and pick up packages of meat anytime they go on sale, that I can use in various recipes, and keep them in my freezer until needed. This helps keep my costs down and I can “shop” in my freezer for dinner inspirations most any day. I sliced the beef into 1-2″ chunks and, using my favorite large stock pot, browned them in a bit of olive oil after dusting them with some flour, salt, and pepper. Since I had so much beef, I did this step in two stages, removing the first half of the beef once it was browned and repeating the process. Once all the beef was crispy, I placed it all back into the pot and added the following ingredients: 1 sliced onion, 4 diced bacon slices, 4 cloves of garlic, 2 bay leaves, 1 beef bouillon packet (I like G. Washington Brown), a few globs of ketchup, and covered everything with a lovely red wine (think James River Cellars Monitor). I stirred everything to combine it nicely, popped the lid on the pot, and put the entire dish into a 300 degree oven to cook for awhile. I think it cooked for about 2 hours, but I was really waiting for the entire recipe to reduce and mesh together well. You could easily reduce the heat on the stove top, pop the lid on, and cook it for the two hours, but I prefer to use the oven when I can for this sort of meal. Once the wine had reduced and the sauce was thick and rich, I added half a bag of frozen peas to bump up the color factor on the meal. The final touches involved adding a few dashes of worchestershire sauce and a small bit of butter to gloss the sauce. It looked delicious! As we got closer to dinner time, I cooked some egg noodles and sliced some crusty bread to complete the meal. The final product was deep, dark, and rich… a perfect meal for a cold, snowy evening, even if it *was* March. I hope you’ll try making your own version of this wonderful recipe. Using short ribs (when on sale) is a great alternative to a piece of pot roast, but you can use most any meat that will handle this sort of long, slow cooking process. Changing up the vegetables by using carrots, pearl onions, or any other favorite vegetable is a great way to add nutrition and tailor the recipe to your family’s preferences. Remember, cooking is about sharing your love with the ones you love. Enjoy! This basic recipe popped up on my Facebook feed one day and I knew that I just had to play with it… it seemed a crime (to me) not to see any red wine listed for this dish! 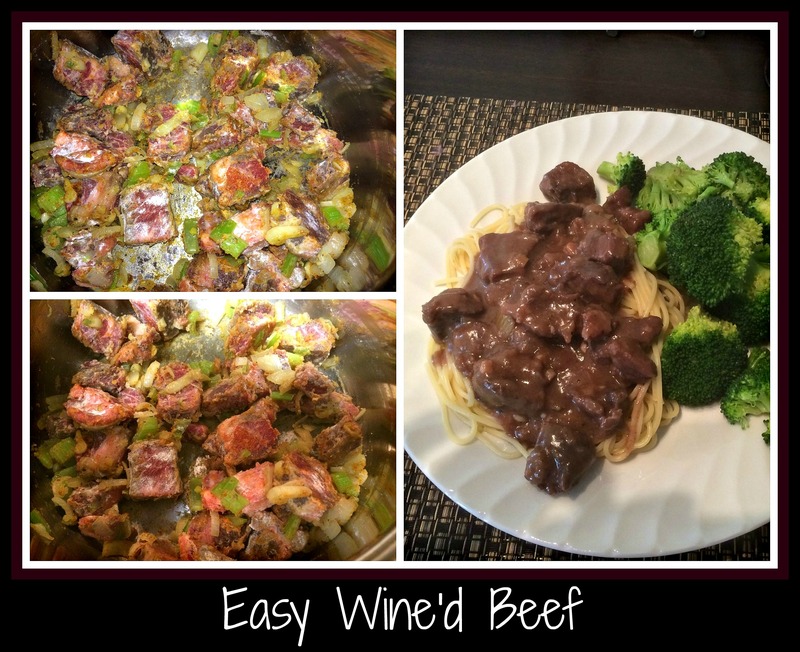 Thankfully, this was a fairly simple dish to use for my family… they love any sort of meat and vegetable dinner. I gathered my ingredients and went to work assembling everything before I left for work in the morning. I used a large package of thin cut beef strips that I’d picked up on sale at the local grocery store a few weeks prior and popped the frozen meat into the bottom of my crockpot. I then mixed 1 cup James River Rad Red Wine (you can use any red wine that you like to drink in this recipe – if you’d drink it in your glass, it’s perfectly fine to use for cooking), 1 packet of G.Washington Rich Brown Seasoning, 1/4 cup soy sauce, 1/4 cup honey, 2 Tablespoons of sesame oil, minced garlic to taste (I use the pre-minced packages, but feel free to add or subtract as you like) and turned on my crockpot to cook on low for 6-8 hours. When I got home from work that afternoon, the house smelled fabulous. All the sweet, salty, garlic-y smells combined to make my mouth water as soon as I walked in the house. I could hardly wait for the guys to get home! I set about making up some rolls to go with dinner and waited for them to be ready to eat. To complete this meal, I needed to turn the cooking liquid for the beef into a delicious sauce… so I removed it from the crockpot, saving 2 cups of the broth in a small bowl, and added 2 tablespoons of cornstarch to thicken the broth. I whisked the cornstarch into the broth until there were NO lumps and then stirred it back into the crockpot of beef. I then added the broccoli and stirred everything together before serving it over the brown rice. This was simple… it was easy… and it was so VERY tasty. Enjoy making this recipe your own – it’s worth it! Maybe I’m just strange, but I really love the challenge of making a totally new meal out of leftovers from a previous meal. Such was the case with how this dinner came about. I made shredded beef sandwiches for dinner on Sunday night and, since I used a large London Broil, had lots of cooked beef left over. 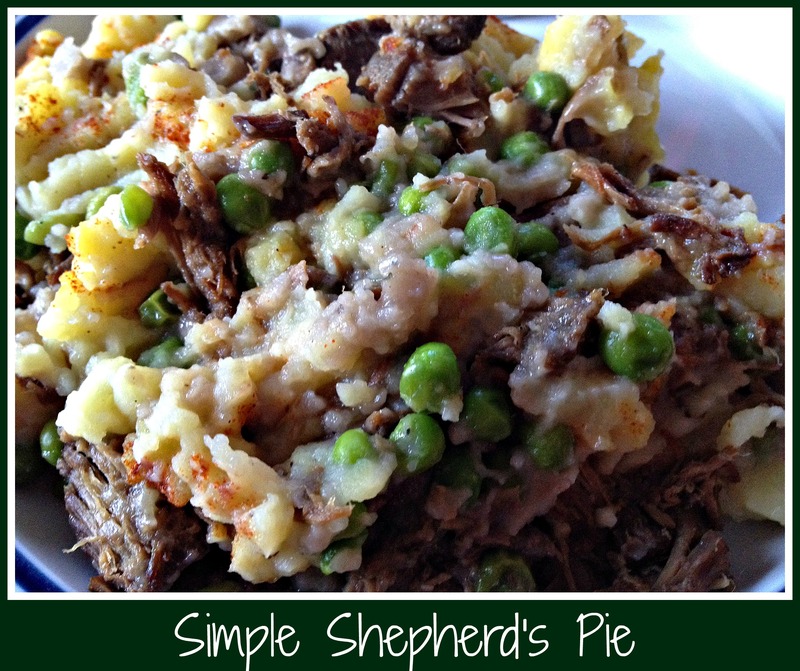 I was coming up with lots of different ways to use this meat but the decision was made for me when I got a huge response from my guys when I suggested making a Shepherd’s Pie. Unfortunately, for me, my husband’s idea of a Shepherd’s pie was “meat, peas, gravy, potatoes”, so that became my recipe. The first thing I did was start making the mashed potatoes by dicing a few potatoes and putting them into a pot of water to boil. 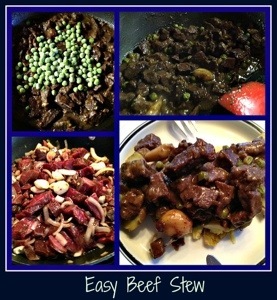 While they cooked, I layered the beef in a casserole dish and topped it with frozen peas. Now all I needed to do was make a gravy so dinner wouldn’t just be dry beef and cooked peas. Making a gravy is so much easier if you start with the cooking liquid of the meat you’re using – it adds flavor without having to rely on bouillon packets. Sadly, I totally forgot to reserve the liquid after dinner on Sunday, so I had to start from scratch. Not my favorite way to do things, but not a huge deal. I have learned to love making gravy, so it’s always a fun creative way to add my own little touch to dinner. I always start with a roux…. equal parts butter (fat) and flour, simmered long enough to cook off the raw flour taste. Liquid is the next ingredient. I typically stick with the idea of using red wine for beef dishes and white wine for chicken or fish dishes, but this is definitely something I don’t mind mixing up. For this gravy, I used a packet of beef bouillon, water, and James River Meritage red wine (‘cuz that’s what was in my fridge… I could have just as easily found James River Merlot or a random Pinot Noir from a recent trip to the Hilton Head Wine and Food Festival). I seasoned the gravy with salt and pepper, and let it simmer a bit until it was thick enough. I then poured the gravy over the beef/peas already layered in the casserole dish and got to work on making mashed potatoes. Please know… if you prefer using instant mashed potatoes, this meal will be just as tasty. I’m not really a purist that has to make homemade mashed potatoes anytime I need them… I just don’t have any instant potato flakes in my pantry. Who knows… I might have used them instead. Honestly, I tend to make mashed potatoes often enough that I almost always have potatoes available in my pantry, so it’s just easier to make them rather than search for a packet of the instant stuff. For my homemade mashed potatoes, I use an old potato masher that my mom gave me instead of using my electric mixer – I like the chunky feel of the finished product better than the more whipped consistency I get when I put everything into my KitchenAid mixer. I use varying amounts of margarine, Laughing Cow light original cheese, a touch of horseradish, salt, pepper, and maybe some milk. It really depends on my mood when I’m cooking, so using The Force really comes into play on this recipe. Once the mashed potatoes are finished, I spooned them on top of the casserole, sprinkled a bit of paprika for color, and then popped the casserole into the oven. After 30-45 minutes in a 350 degree oven, this dinner is ready for the troops to dig in. Feel free to experiment with this recipe to make your own family happy – if they like cooked carrots, feel free to add them. Want a whole mess of veggies? Go ahead! Want to swap out the beef for chicken or a vegetarian option you like? Try it! There’s no “dinner police” who will come by and take your food from you, so enjoy coming up with your own options on this recipe. I just like the tastes of beef, peas, and mashed potatoes all baked into a sublime concoction that makes my family happy. Ultimately, that’s the goal… make something that will feed your family and keep a smile on their faces. My heart is full every time my guys declare a “winner”… may you have the same experience with your dinners! My younger son came home from college this past weekend and, as luck would have it, I was working on Sunday… so I decided to make an easy dinner in the crockpot that we could use for a day or two. For Dinner #1, I put a sliced onion, two fairly large pot roasts (on BIG sale at my local grocery store), salt, pepper, and a half bottle of James River Cellars’ Rad Red wine into my crock pot. I then turned the thing on as low and slow as it would go and let it cook the entire time I was at work. **It’s ok, really…I was only working a 6 hour shift. When I got home, there wasn’t much more I had to do before dinner was ready. I ladled out all the liquid into a fridge-friendly container (this stuff is gold… like a beef consume that I didn’t have to babysit? Awesome!) and set about shredding the beef for sandwiches. I’d already bought rolls and M sweetly went out and picked up some BBQ sauce (would have sworn we had some in the house), so this weekend dinner was a quick fix for everyone. For Dinner #2, I started with 2 Tablespoons of flour and 2 Tablespoons of margarine. Once the margarine was melt ed and the flour was bubbling away, I began to add some of the reserved beef consume that I’d saved from Dinner #1. I added enough, slowly to allow things to gel nicely, until I had a good amount of sauce. I also added a splash of worchestershire sauce and some Viognier white wine to add some depth to the sauce. I could have eaten this with a spoon… turned into such a yummy gravy. While playing with the sauce, I made a small, quick batch of mashed potatoes. You could certainly use instant mashed potatoes if you’d prefer, but making homemade seems easier to me (as long as I have a little time). When the potatoes were “mash-able”, I added some milk, margarine, and a half teaspoon of horseradish before mashing them for the topping and setting them aside. Into the gravy went a nice amount of the shredded beef from Dinner #1. I stirred it into the sauce and then sprinkled frozen peas on top everything. Since the peas were frozen, I stirred them into the mixture and then topped everything with the homemade mashed potatoes and a liberal dash of paprika (for color). It looked so tasty! Your Shepherd’s Pie is now made… and just needs to bake a bit. I popped the entire skillet into the oven and added a package of frozen biscuits, using the time and temperature needed to bake the bread. Once everything was done, I plated dinner for the four of us and sat down to eat… simple, filling, and really comforting. There’s something so great about being able to turn out an old-time dinner on a “new age” time schedule. If you have a favorite from your childhood, there’s nothing better (IMHO) than being able to create it using some current cooking tips. I love coming home to a house that smells of something baking in the oven. It makes me incredibly happy to create meals for my family that remind me of when I was a child. This dinner was one of those meals. I hope you’ll try something like this for yourself… and may the warmth and comfort of “home” bring you a few moments of peace in an otherwise hectic day.